home index e-mail what's new? 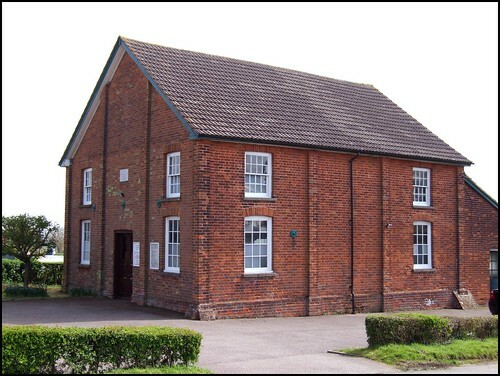 This 19th Century Primitive Methodist chapel stands in a prominent position at the centre of this busy village, while the medieval Anglican church is tucked away down a remote lane a mile or so off. This is a pretty good illustration of the way in which the churches of the two traditions have established themselves; Anglican churches are parish churches rather than village churches, and there is no reason to expect to always find them in the centre of the largest village in the parish. 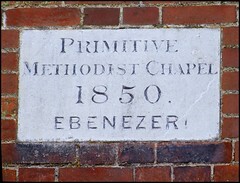 Conversely, by the 19th century the modern pattern of settlement was pretty well established, so it is no surprise to find the non-conformist chapels sited in the hearts of them. Despite the modern pitched roof, this handsome red brick building is severely grand in the manner of earlier in the century, brick banding forming almost an arcade on each side. The shop across the road is a welcome haven for anyone cycling around this curiously remote area of East Anglia.